Blogging two weekends in a row! Must mean I'm winding down at work and gearing up for some holiday crafting. I'm off on a course next week and it occurred to me I might need a notebook. The perfect opportunity to try out a technique that Lindsay Mason introduced me to. First I masked off the spine on a cheap supermarket notebook. I stuck on embossed paper, die cuts, metal embellishments and metal studs, then painted everything with a coat of Little Black Dress (sorry I forgot to photograph that step). I then covered the background with Viva Decor Maya Gold, working the paint in to all of the nooks and crannies. When the base was dry I used two more colours to paint the letters. To finish off a little Treasure Gold was used to highlight the edges and bring out some of the texture. No chance my notebook will get mixed up with anyone else's! I don't seem to be getting much crafting done at the minute but an unexpectedly free Saturday (thanks to Dave Grohl of the Foo Fighters) meant I could get my Craft Barn June calendar challenge done. 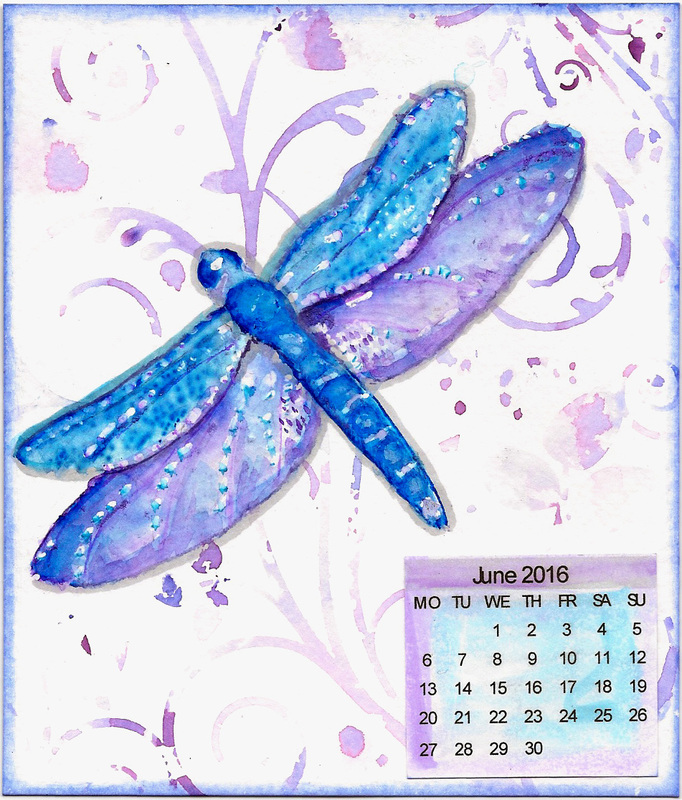 This month the theme is lavender and dragonflies. I was messing around and experimenting with Brusho and my new Spectrum Noir aquamarkers and not thinking about making anything in particular so there's only the final photo. I started by sketching a dragonfly and used masking fluid to protect some white areas. I watercoloured with Gelatos and Spectrum Noir aquamarkers then masked over the whole dragonfly and used Brusho sprinkled over a stencil, blotting on the dragonfly card for the background. A little bit of touch up with a Promarker and a swipe of shaded lilac around the edges finished it off.